How to add two given times in HH:mm:ss format in Java? Home Date Interview Questions Difficult Date Questions How to add two given times in HH:mm:ss format in Java? Write a program in Java that adds two times that are given in format HH:mm:ss with proper validations. For example - addition of 11:12:45 and 23:45:44 is 1:10:58:29 or 1 Day 10 Hours 58 Minutes 29 Seconds. The algorithm that we are using for solving this problem is very simple and straight forward. Split both given strings by delimiter ":". Now we have to convert hours, minutes and seconds to Integer. Do an addition of hours, minutes and seconds. If the value of hours>23, add 1 to days because 1 day=24 hours, if the value of minutes > 59, add 1 hour to hours because 1 hour=60 minutes and if the value of seconds > 59, add 1 minute to minutes because 1 minute=60 seconds. Convert hours, minutes and seconds into String and combine using ":". * @problem How to add two given times in java? // Separating first String using delimiter ":"
// Separating second String using delimiter ":"
* of hours>23 adding 1 day to days. // Converting each integer value of String and combining all Strings. Output - How to add two given times in Java? 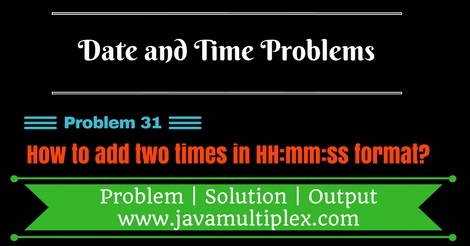 Tags : Date and Time problems, Time addition in Java, Solution in Java, String, if else statement, Regular expressions.